I don’t know about you but January is definitely my least favourite month of the year. The excitement of Christmas has gone, making way for much less pleasant things such as; returning to work, the prospect of snow and the terrifying thought of perhaps joining a gym. 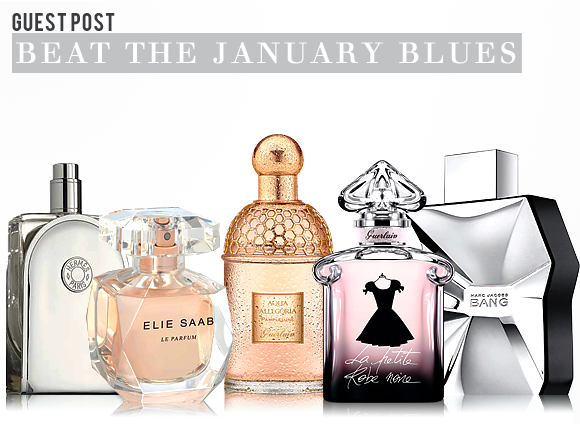 With all of that in mind it can be difficult to shake off those January blues. But fear ye not dear reader, I have a compiled a list of fragrant pick-me-ups that should bring you right out of that January rut and get your minds thinking of the brighter, warmer and more enjoyable months of the year. One way to conjure up thoughts of summer is by wearing citrus scents and perhaps the most satisfying fruity note is grapefruit. Good grapefruit scents are hard to find and Guerlain’s Pamplelune is one of the absolute best. It is a photorealistic rendition of a big luscious grapefruit, squeezed of all of its sweet, acerbic juices and blended with a large dose of fuzzy patchouli. Pamplelune is a scent that has the ability to bring a dose of sunshine to your skin whilst, thanks to the darker base notes, simultaneously exuding a very welcome warmth that will most definitely keep you comforted during the coldest (and lets face it – naffest) months of the year. Another fragrance that radiates solar light is Le Parfum by Elie Saab, but where Pamplelune uses citrus to create brightness, Le Parfum’s sparkle comes from orange blossom and musk. Together these two materials create an intense golden radiance that is incredibly uplifting and very pretty. Le Parfum is an incredibly versatile fragrance that can be worn for any occasion, whether it be mooching around the house in your onesie (we all do it!) or any more formal occasion. Guerlain’s La Petite Robe Noire (The Little Black Dress) is a party in a bottle; it’s a ditzy, fizzy cocktail of cherries, berries, rose, tea and liquorice. I’m not entirely sure what state you’ll return in after your night out with La Petite Robe Noire but I’m pretty sure it will be some of the best-scented fun you’ve ever had. It’s not too early to start planning that summer break, heck, why not just book a flight to somewhere exotic to soak up some January sun?! Failing that you could always opt to pick out a scent that is evocative of travel and long journeys to far away places. Voyage d’Hermès is a scent that doesn’t smell of a particular space or time; instead it feels like a mixture of different cultures, as if it contains just a little of bit of everything, there’s; a little bit of pepper, a little bit of tea and a little bit of something mineral-like, just to name a few. The addition of effervescent cardamom and Hedione (a material that adds a luminous floral, jasmine-like quality) gives the whole thing a wonderfully silky texture that is just so effortless to wear and even easier to enjoy. As you would expect from its onomatopoeic moniker ‘Bang’ is most definitely an explosion of a scent. It’s a scent that will kick start your day, flying out of the bottle at about 100 mph in a haze of pepper and metal, but it also settles down rather quickly to an incredibly enjoyable skin scent that will keep you going throughout those long January days with the occasional whiff. This entry was posted on Monday, January 14th, 2013 at 9:42 am and is filed under Candy Perfume Boy, Fragrance, Guest bloggers. You can follow any responses to this entry through the RSS 2.0 feed. You can skip to the end and leave a response. Pinging is currently not allowed. Mmmm I love Pamplelune but I’ve never tried it in winter. Have made note to self to give it a go. The cherries in LPRN are not for me but my son’s gf wears it prettily. Never tried the Elie Saab. Second note to self, must test. Gorgeous post Thomas… am now intrigued to try the Pampelune!